Believe it or not, politics can get pretty interesting across the Tasman. Our Kiwistani cousins in Wellington have certainly mastered all those finer Machiavellian arts Canberrans are used to reading about in this newspaper. And the issues fought over in Wellington ’s “beehive” (the affectionate name given by Kiwis to their parliament house – even the official government website address is www.beehive.govt.nz) are much the same. Last year, Peter Costello delivered some modest tax cuts. Within 2 months, New Zealand ’s ruling Labour-led coalition government delivered a budget with even smaller tax cuts. Helen Clark and [NZ Treasurer] Michael Cullen clearly believe there is a place for tax cuts - it's called Australia. That was June 2006. By November the National Party leader wasn’t sounding so … er … brash. The book that played a key role in his demise is the subject of this review. 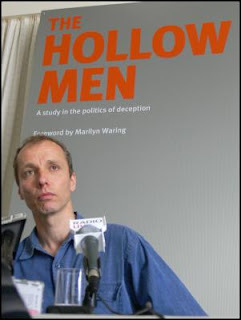 The Hollow Men is the work of Nicky Hager, said to be one of New Zealand ’s most celebrated investigative journalists. This is Hager’s third book. The controversy surrounding the book is perhaps more exciting than the book itself. Set for release on Tuesday 21 November 2006, crucial contents of the book were the subject of an injunction made on the previous Friday in the Wellington High Court banning its publication. The legal proceedings brought by none other than Dr Brash himself. The injunction barred publication of certain e-mail correspondence between Dr Brash and other parties (presumably advisers, constituents and Party colleagues). These leaked e-mails were crucial source material used by Hager in his book. Two days after the scheduled publication date, Brash withdraw the injunction application and announced his resignation from the National Party leadership. The book hit New Zealand bookshelves the following day. Brash left the beehive for good in February 2007. The book is largely about the rise of Don Brash to the leadership of the National Party, and what almost became the coming to power of a Brash government in the September 2005 elections. Many of the themes Brash used – indigenous and racial wedge politics, policy making in the financial interests of donors, adoption of far-Right policy positions – will be familiar to close observers of the 11 years of Howard rule. Brash no doubt tried to model himself on John Howard. This book has promise, but the author tends to ramble on and becomes lost in superfluous detail arising from the e-mail exchanges he uses. Sadly, much of the alleged “exposure” of National Party policy processes borders on polemical rant. It’s one thing to accuse the Kiwi-Nats of telling lies over their dealings with Crosby Textor and the Exclusive Brethren. It’s another to pass off one’s criticisms of certain National policies as fact. Peter Costello recently described Howard as a lacklustre treasurer and economic reformer. I doubt Costello would say the same about Dr Brash, who worked for the World Bank before serving for 14 years as Governor of the Reserve Bank of New Zealand. His tenure coincided with the free market reforms of former Labour Finance Minister Sir Roger Douglas. Later Douglas went onto establish the free market fundamentalist ACT Party. However, this book isn’t just a political biography of the former National Party leader. The book exposes the secretive political campaign tactics used by the fringe fundamentalist Christian sect known as the Exclusive Brethren. Although officially the Brethren bars its members from voting and regards worldly politics as evil, key members of the Brethren have been involved in a number of campaigns supporting conservative candidates in the United States, Australia and New Zealand. The Brethren campaign was especially active in the September 2005 elections. Large advertisements were published in major newspapers calling on Kiwi voters to “change the government”. National MP’s denied any knowledge of the Brethren campaign. Yet sources inside the National Party provided Hager with e-mail correspondence which showed that Brash and other National MP’s held meetings with Brethren officials and were aware of Brethren political advertising. The book also contains a very interesting chapter on the role Australian pollsters Crosby Textor (C/T) played in the Brash campaign. Like much of the book, the contents of the book’s C/T chapter (titled “The Manipulators”) border on the conspiratorial. The chapter starts to get interesting when it talks about C/T focus groups in late 2004. You might imagine that focus groups are designed to find out what groups of people think and want … the Crosby/Textor groups had a completely different purpose and revealed a deeper level off political manipulation. … The intention is to ‘uncover’ perceptions and feelings of which the people concerned may be consciously aware – or even just potential perceptions and feelings – and find ways to use these ‘persuasive creative leads’ to influence target groups of voters. Much C/T work with the Kiwi-Nats focussed on developing dog-whistle messages about immigrants and indigenous people. Simplistic messages containing thinly-veiled racism were almost enough to get Brash over the line. The balance of the book is somewhat tedious, especially for readers with little interest in provincial New Zealand politics. Hager seems to get carried away with the novelty of having a year’s e-mail exchanges between National MP’s, their staff and their supporters in business, conservative think tanks, pollsters and fringe fundamentalist churches. A more interesting version of the book probably would have been half its current length. First published in The Canberra Times on 13 October 2007. During a recent interfaith conference of the Abrahamic faiths, the representative of a conservative Catholic thinktank spoke critically of what he referred to as an increasingly encroaching secularism that often did away with shared religious and ethical values. His critique on secularism drew a rather angry response from a number of Jewish members of the audience, many of whom interpreted his speech as a call to bring back the kind of theocracy that led to such excesses as the Spanish Inquisition. Speaking of which, in November 2005, former National Party Senator John Stone used the Opinion Page of The Australian to invite people to join his “Queen Isabella Society”. Though on that occasion, the desired inquisitorial targets were not Jews but Muslims. In modern Australia , sectarianism rarely goes beyond the occasional provocative op-ed piece. But in the world’s largest democracy, ancient religious hatreds are frequently used as modern political tools to deadly effect. This year marks 60 years of Indian independence, as well as the birth of the modern and nominally Muslim state of Pakistan . The founders of both states envisaged two modern secular states living side by side and maintaining good relations based on their shared cultural heritage. Yet in the weeks and months around Partition, over 1 million people lost their lives in religious riots in northern India ’s Punjab and Bengal wings. In the cities of Lahore and Amritsar , on either side of what was then India ’s boundary with West Pakistan , it wasn’t unknown for silent trains to enter their destination, their carriages turned into communal coffins. How can modern secularism overcome such ancient hatred? After all, we in the West regard secularism as involving keeping religion away from politics wherever possible. Our understanding is based on the presumption that religion can only play a destructive, not cohesive, role when allowed to dominate the public square. David Davidar’s latest work The Solitude of Emperors is a reminder that secularism can take other forms. Vijay, a young South Indian journalist and one of the primary characters in the novel, narrates his escape from a suffocating rural home to work as a journalist in Mumbai. His employer is Rustom Sorabjee, a wealthy member of the ancient Parsi community, descendants of the Zoroastrians of Iran who fled the armies of the Muslim Caliph Omar in the 7th century AD. Sorabjee is publisher and editor of The Indian Secularist, a magazine with a small but elite readership of Indians opposed to the growing influence of Hindutva (Hindu chauvinism). The novel is set during the aftermath of the destruction of the ancient Babri Masjid, an old mosque built by the Mughals in the North Indian town of Ayodhya , regarded by Hindus as the birthplace of Lord Rama. The destruction of the mosque on 6 December 1992 saw the beginning of the rise of far-Right Hindu chauvinism that led to the election of the neo-fascist BJP government. The sectarian riots reach Mumbai, and Vijay finds himself witnessing a mob of crazed fanatics hacking at the remains of Muslim civilians. The mob demand proof from Vijay that he is not Muslim, even insisting he expose the absence of traditional Muslim circumcision. One of the mob notices Vijay wears the sacred threads showing he is of the Brahmin Hindu caste, but bashes a metal bar on Vijay’s head for good measure. The incident leaves Vijay disturbed and suffering post-traumatic stress. His employer suggests Vijay take time off in a small village in the Nilgiris mountains in the southern Indian state of Tamil Nadu. This novel is not as much about politics as about religion and history. Mr Sorabjee gives his employee two tasks. First, Vijay is to report on the struggle to protect The Tower of God, a Christian shrine at the top of a mountain revered by followers of all faiths. Hindutva activists believe the shrine is built on the ruins of an ancient Hindu temple and are agitating to destroy it. Vijay’s reporting is to occur within the context of his second task – reviewing Mr Sorabjee’s book The Solitude of Emperors: Why Ashoka, Akbar and Gandhi Matter to Us Today, excerpts of which appear in different parts of the novel. Though Sorabjee’s work is a defence of secularism, Western readers will find its approach somewhat novel. Far from insisting religion (and religious people) remain aloof from government, Sorabjee champions the idea that religious citizens of modern India change their attitude toward both their own faith and the faiths of their fellow Indians. This book within the book attempts to define secularism as a messianic force which will eventually lead to the creation of an India which maintains its religiosity without compromising its pluralism. The promised secular Messiah would be a leader who combined the best qualities of Ashoka (the warrior-king who left war behind to sprad the message of Buddha), Akbar (the Mughal Muslim king who developed a hybrid religion containing elements of all faiths) and Gandhi (who developed the Hindu doctrine of ahimsa into a modern form of non-violent activism). Sorabjee sees the common thread of these three Indian leaders as their willingness to occasionally embrace solitude, to remove themselves from the hysteria of their communities and rise above commonly held prejudices. So much of our own modern politics is driven by advice from spin doctors encouraging their clients to make statements and develop policy based upon little more than popularly held prejudice. Davidar’s novel provides a believable Indian scenario of where such politics might lead in the long term. It also opens our eyes to uglier sides of Indian cultures which will surprise Western readers enamoured by all things Indian but which Indians take for granted. Irfan Yusuf is associate editor of AltMuslim.com. His parents were born in Delhi. This is an expanded version of a review first published in The Australian on 13 October 2007.